Also known as “Mang Ben,” LSA Grandmaster, Benjamin Luna Lema, was born in Mambusao, Capiz on the island of Panay on March 19, 1919. As a young man, Grandmaster Lema explored Karate, Judo, boxing and weight lifting. His father, an esteemed Arnis teacher in Panay, started training him in Espada y Daga (Sword/Stick and Dagger) at the age of 17. Grandmaster Lema also traveled across the island of Panay, training under masters such as Master Mauro Buhat, Master Jose Fernandez and Master Lorenzo Langsun. 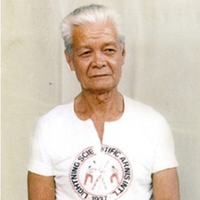 In 1937, Grandmaster Lema created Lightning Scientific Arnis (LSA), combining his learned knowledge from his father and masters into a comprehensive Filipino Martial Art self-defense system. LSA incorporates the traditional techniques of Tercia Serrada Cadenilla y Espada y Daga, which roughly translates to “close quarters, closing the range with a sequence of chained movements of sword and knife.” LSA applies these techniques through the use of single stick, double stick, stick/sword and dagger, knives, and hand-to-hand combat. Master Jon Escudero started training in LSA in 1996, and in 2001, was the last and youngest person awarded the rank of Master by legendary Grandmaster Lema. Master Jon developed Lightning Combatives, headquartered in Tel Aviv, Israel, which derives simple solutions from LSA and adapts them for real-world application. We keep you on your toes in here so you can think on your feet out there, equipping you to use whatever tools are available for self-defense.